William G. Clark, Jr. was admitted to the Illinois Bar in 1977. Work Experience: President, William G. Clark, Jr. & Associates, Ltd. 1982 - present; Partner, Dore & Clark, Ltd., 1980-82; Associate Attorney, Kluczyski, Dore & O'Toole, 1977-82; Teacher, St. Benedict High School 1972-1977; Teacher, Marist High School 1971-72. Bar Admissions: Supreme Court of the United States of America, 1988; United States Court of Appeals for the Seventh Circuit, 1982; United States District Court for the Northern District of Illinois, 1978. Professional Associations: American Bar Association; Illinois Bar Association; Chicago Bar Association; Illinois Trial Lawyers Association; American Academy of Matrimonial Lawyers; DuPage County Bar Association. Awards & Acheivements: Speaker at Chicago Bar Association Seminar, topic "The Trial of a Divorce Case", December 10, 1998; Speaker at Illinois Institute for Continuing Legal Education Program, topic "Effective Use of Experts in Matrimonial Cases", October 1, 1993; Speaker at annual Chicago Bar Association Continuing Legal Education Program, topic "Special Circumstances Involving Child Support and Maintenance," September 21, 1989; Author of the introduction to "Suggested Guidelines for Supervised Visitation" , 74 Il. Bar Jour. 244, January, 1986; Volunteer Chicago Bar Association In Court Laywer Referral Program. Represented many defendants who were unable to afford private counsel, 1979-81. Volunteer Attorney, Legal Aid Bureau, United Charities of Chicago. Represented indigent persons in divorce actions and other family law matters, Pro Bono, 1979 - present; 2002 & 2003 Chicago Volunteer Legal Services Distinguished Service Award. 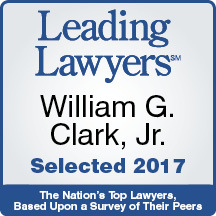 William G. Clark, Jr. & Associates, Ltd.